If you are dressed up like a million dollar trouper and have a few hours to spare, one of the best brunches offered in Washington, D.C. is at the Fyve Restaurant Lounge in the Ritz-Carlton Pentagon City. The place is not big but highly luxurious. The staff make sure everything is top notch and the buffet selection is beyond one’s imagination. You can go for salmon, shrimps, the likes, or have a more traditional breakfast. There is also a main course included in the price (if you can still eat after helping yourself a couple of times at the buffet). 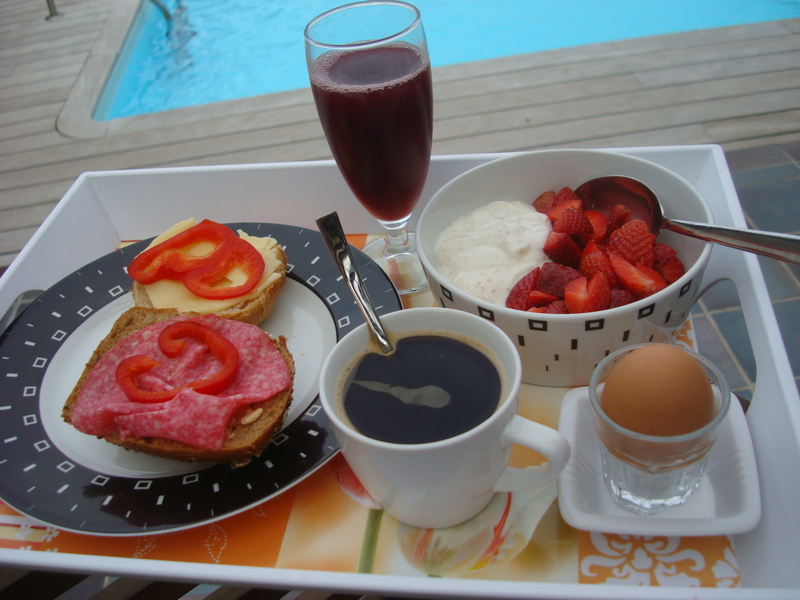 After a small breakfast (ehum, don’t even THINK I eat all of this by myself, Sam was of course insisting on having yogurt with strawberries) I listen to some music or radio and pass out on the sun bed before I take a morning swim in the heated pool. This is not as relaxing as it sounds since Sam runs around the pool in circles while barking hysterically. I think he is convinced that I am drowning every time I get into the water. Actually, I’m not THAT bad at swimming…I hope. Located in the ultra-chic and ultra-expensive New York Hotel Mandarin Oriental, Asiate offers gourmet cuisine and arguably one of the best views, being situated on the 35th floor overlooking Central Park. Designed by Tony Chi who has dazzled with his contemporary and cool designs of hotels and restaurants worldwide, Asiate is grand without being overbearing; fun-looking without being kitschy. Don’t forget to check out their impressive wine wall with over 1,000 bottles to pick from. The food is fabulous and can be best described as fusion with Asian influences. Try their Prix Fixe three-course menu with a nice selection of starters and main courses. If you are into shellfish, we would highly recommend the prawns as a starter and poached lobster as a main, you won’t be sorry – they are cooked to perfection and served with subtle sauces. To make a long story short, we loved Asiate, the food and the view will make us come over again. We hope that by then Asiate would be given a Michelin Star, we find it hard to understand why it yet doesn’t have one. OK, here is a hot recipe you can make without breaking a sweat (ah, but you will when eating). In fact, it will even make your eyes water. Put sesame oil, peppers, pineapples, chili and sweet chili sauce into a hot pan. Mix in the pineapple juice and the crab sticks. Add salt, pepper, garlic and curry powder to taste. Cook for about 10 – 15 minutes. Boil the noodles. Add the spicy crab stick sause and garnish with chopped leeks. Enjoy with a glass of chilled rosé and beware – you will be breathing fire! Don’t you get tired of French fries and heavy carbs sometimes? Sam’s grilled peppers is an excellent side dish to meat, sausages or chicken and it’s so easy to prepare that even Hanna and Alex can do it (OK, maybe not Sam). The spicy mango salsa lightens up, with a splash of colors and flavors, an otherwise boring lunch or dinner. Basically something very tasty and healthy to replace that everyday mom-not-again-fare. Start preparing the salsa: mix mango, chili pepper, fresh mint, garlic, lime juice and mango vinegar. Add salt and black pepper to taste. Moisten the peppers with some olive oil before you add the salsa mix. Top off with feta cheese. Bake in the oven at 200C for approx. 25 minutes. Let cool down, serve and be prepared – your guests will be coming for more!